I’m not afraid to admit that it takes a lot to impress me. One of the perks of the job is to review great hotels. Some even world class. I even try to squeeze in a stay at a top hotel during my summer break, so I could easily be labelled a difficult travel customer with high expectations. Gleneagles has always intrigued me as I’ve wondered whether all those claims and accolades were just PR spin. Hailed as one of the country’s most iconic hotels, even its golf courses are rated by the world’s elite with the Ryder Cup taking up temporary residence there in 2014. Then there’s the restaurant by Perthshire born, two Michelin starred chef Andrew Fairlie, a celebrity in his own right for his award-winning masterpieces prepared for a host of celebrities and authoritative figures – Her Majesty included. And, with a ratio of more than one member of staff per guest, Gleneagles is out to impress. The hotel, built in 1924, was designed in the style of a French chateau and is surrounded by immaculate landscaped grounds. The building’s old world appeal and grand elegance give remarkable first impressions – when you arrive at Gleneagles you know you’re onto something good. The interior of the hotel is a successful fusion of antiques and Art Deco lights with contemporary style and comfort. Bedrooms are kitted out with all the mod cons while the new top floor suites with picture postcard views are simply jaw dropping. But, in spite of the unashamedly opulent setting – and knowing this five star beauty is the hotel of choice for the rich and famous who discreetly check-in here – the ambience is warm and welcoming, with friendly unobtrusive staff. 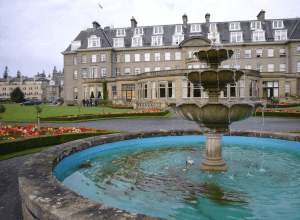 Gleneagles is more than a hotel – it’s a stunning resort set in 850 acres of Perthshire countryside with all the facilities to suit business or leisure pursuits. Even kids seem to feel at home here. But it’s the relatively new spa that stole the show for me. Recently winning the British Beauty & Spa Award for Hotel Destination Spa of the Year for the second year in a row, this is one heck of a retreat. Think luxurious private changing rooms (with low flattering lighting), fluffy robes and slippers, gorgeous ESPA products and a dark and moody state of the art thermal suite where you could easily book in for the weekend and forget all your worries. The facilities, which are separate for men and women, include a steam room with light therapy, tropical rain and ice showers, ice crystals to kickstart sluggish circulations and an expansive sauna which overlooks the small but perfectly formed hydrotherapy pool. I relaxed there for a full hour prior to my indulgent treatment and only one other person joined me – clearly the staff have the timings down to an art form giving pampered souls privacy too. After my complete stressbuster ritual – one of the spa’s signature treatments and 80 minutes of massage heaven – I emerged relaxed and rejuvenated. Gleneagles had won me over. Gleneagles gift vouchers are available for purchase online at www.gleneagles.com and Christmas is coming so for a present that friends and family will remember for years, take note. At only an hour’s drive from Glasgow, Gleneagles is a destination for the discerning who appreciate the finer things in life. With standards and impeccable service of a bygone era – this hotel lives up to all the hype.